In my college days of the late 1970s, others went to beer parties while I drew a few arcologies. While digging through my files, here's a look. Image on the right is a more recent version done with Neopaint. Sloping blue surface is a solar collector, or could be windows over an atrium. 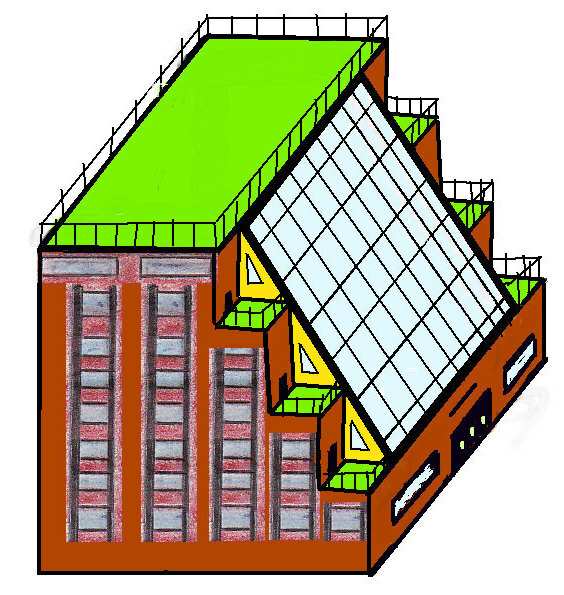 Roofs can be green spaces. Nothing is to scale. It's just sketches of the concept. Here are some excerpts from the descriptions I wrote back then. 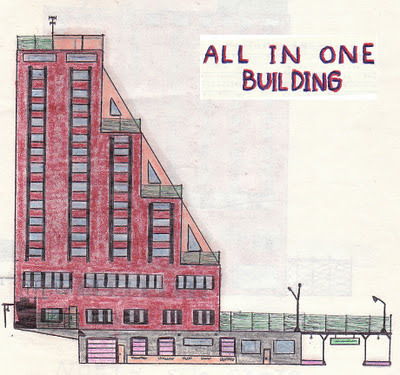 Title: All In One Building. 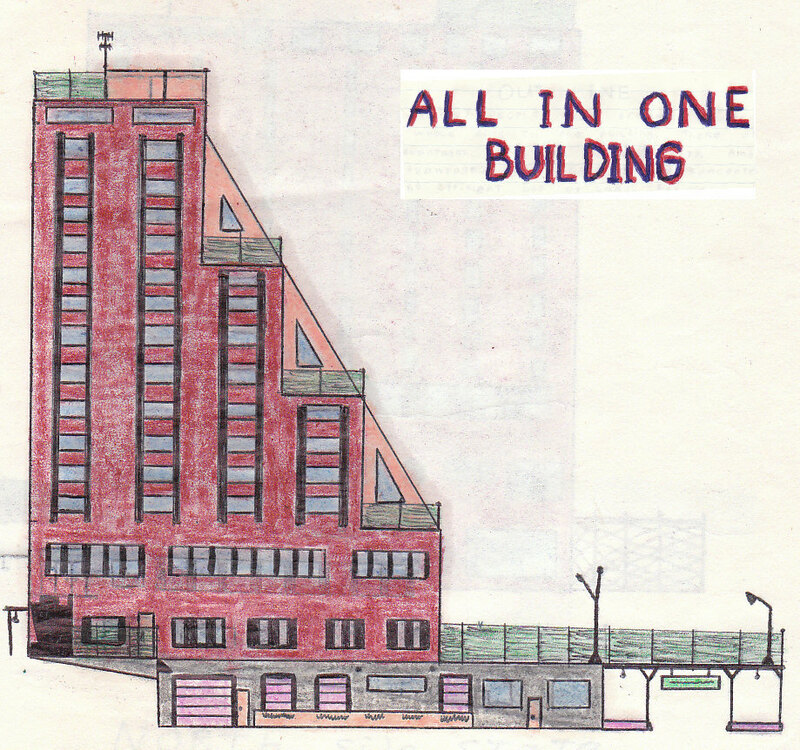 AIB (All In One Building) is a community within one building. This little "city within the city" contains 90 dwelling units, a hotel, stores, offices and a recreation center. The building serves as an integrated living, working and playing environment for not only it's tenants, but others as well. * Efficient use of land. * Energy savings for heating and transportation. * The ability to visit anywhere in town without being exposed to inclement weather. * Hopefully a unified community spirit. AIB is a compromise between the standard apartment house and a free standing city. It is a "one building neighborhood" within a larger city. Due to it's location within the city, AIB's residents are able to take advantage of a wide range of facilities that are largely supported by outside customers. Things like stores, restaurants and a recreation center can serve the region, beyond just AIB's tenants, so these facilities can be larger than just the size of what would be economically viable for just the residents. Some businesses, like a laundromat, could serve many uses such as washing towels for the recreation center, bedding for the hotel and various walk in customers from both within AIB and the surrounding area. Other common services could include things like a reception desk. Side view. See more text below. * Residents of the apartments. * Business owners and employees of firms that lease space from AIB, such as for retail and office space. * Outside members, such as those joining the fitness club. This building would be full of clubs and discussion groups. There would be dancing, dining, saunas and even swimming under one roof. Plus it could be located in a city, or possibly a college campus. Imagine a whole city made up of these kind of intentional communities. More recently, (2016) the concept of a Phalanstery has been brought to my attention by my friend Kody Bosch who studies design.